Are you likely to be jabbed by a syringe on the train? A Channel Seven report shows that there have been 55 incidents of people being jabbed by syringes left on Cityrail trains and stations over the last 3 years. Sounds like a big deal, until you put this into context. There are about 300 million trips made on the Cityrail network each year. So over 3 years, that’s almost a billion trips, of which 55 have resulted in someone getting jabbed by a syringe. That means we’re talking one in twenty million. So let’s put that into context by listing things which are more likely to happen, based on 20 million to 1 odds. Now don’t get me wrong, this is a serious issue that could lead to some terrible diseases being spread. But the chances of it are so unlikely that it’s almost not worth worrying about. The Australian newspaper claimed recently that the NSW and Commonwealth governments are “no closer to resolving their differences on the Epping-Parramatta rail link [PERL] than on state election night, a year ago”. The Commonwealth government pledged at its last election to provide $2.1 billion of funding for the PERL, while the NSW government pledged at its last election to prioritise the Northwest Rail Link (NWRL) over the PERL and wants that $2.1 billion to be provided for the NWRL instead. This suggests that either resolving this issue is not an immediate priority for the two governments or that neither is willing to budge from their existing position. If it is the former, then there remains hope that a compromise solution will eventually be reached (perhaps Ms Berejiklian is waiting for the next federal election in the hope that a new Abbott led Liberal government will be easier to negotiate with, or that the threat of loss for the federal Labor Party will give her an edge in negotiations). However, if it is the latter then this can only lead to a lose-lose situation where nothing happens and the infrastructure deficit in NSW is added to. Given that both the NSW and Commonwealth governments went to their last elections promising to build the PERL and NWRL respectively, I can understand the problem arising from neither government wanting to break its promise. But a compromise solution is really the only way to break the deadlock, and the only way to arrive at this is through negotiations and by considering other, innovative, solutions to Sydney’s transport problems. 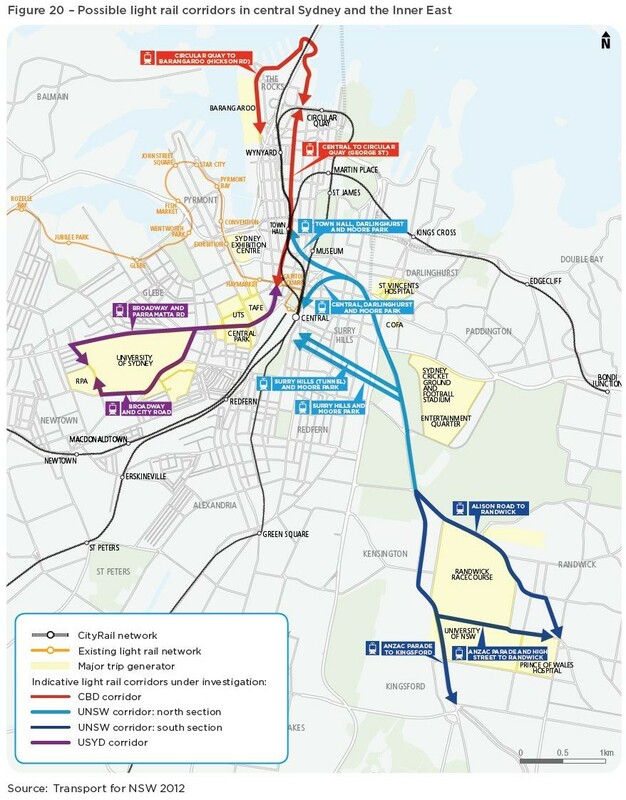 I’ve previously written about how light rail or bus transit ways have been suggested as a way to create a short term connection between Parramatta and Epping/Macquarie, which would provide a stop gap for the missing link until the PERL is constructed to provide a solid long term solution. The form of transport solution should not be the focus, instead the focus should be on getting a more efficient transport connection to build capacity, one that can be build in the near future and within a certain budget. Cristina Mojica, Acting General Manager for Rail and Intermodal, wrote that the Australian government has provided funding of “$12.2 billion to 2013-14 on road and rail project [sic]…also committed and additional $2.1 billion from 2014-15 to construct the Parramatta to Epping Rail Link”. She then argues that “public transport is primarily a responsibility for the New South Wales Government” and that my letter has been forwarded to the NSW transport minister’s office for consideration. It does appear like quite a cop out that the Commonwealth Department of Infrastructure can on one hand boast about how much infrastructure funding they have provided and where they have directed it to, then defend its decision to fund certain projects but not others by pointing out that these decisions should be made at the state level. The very decisions that it is insisting on making itself in choosing to fund the PERL over the NWRL. Kate Foy, General Manager for Customer Service, indicated that my letter had been forwarded to Transport for NSW for advice on the matter. I have yet to receive a follow up response. David Gray, Manager for Transport Planning, writes that the council is aware of the bus transit way proposal, and that though there were “possible advantages”, that there were also “disadvantages of T-Ways including the congestion created with the large number of terminating buses in Parramatta city centre and the lack of suitable layover space”. For this reason, the council is seeking funding for a light rail feasibility study. While I was disappointed to hear that they were not putting more options on the table, this was the only response I received that understood that a compromise solution was the only way to progress in this situation. 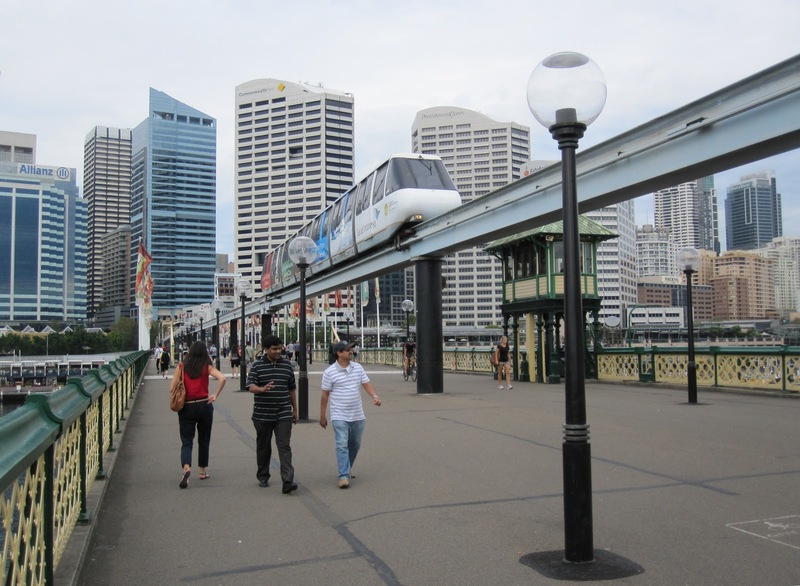 On Friday, the state government agreed to pay $20 million to buy Metro Transport Sydney (MTS), the company that owns the monorail and light rail. Now back in public ownership, the government plans to tear down the monorail as part of its redevelopment of the Entertainment Centre, while also making it much easier for the government to go forward with its planned expansion of the light rail system (by removing the need to negotiate with and come to an agreement with the private owner of the existing light rail line). Considering that the Entertainment Centre redevelopment will cost $550 million and the light rail extension into the Inner West plus CBD will cost $500 million, the $20 million cost to buy the company outright does not seem excessive. Mr O’Farrell points out that the problem with the monorail is that it doesn’t go anywhere people want to go. There was actually one time in my 20 years living in Sydney when I was in Pitt Street Mall and wanted to go to the Convention Centre side of Darling Harbour in which I realised the monorail would take me from where I was to where I wanted to go. Though for $4.90, it was quite an expensive trip and I may have been better off walking. So I think the Premier is right on the money with his analysis. The curious thing about this move is that the Liberal Party is generally known as the party that favours the market and privatisation over government control, yet it has chosen to take back ownership of a private company. Veolia is being retained as the operator of the light rail, though I expect that once this contract expires the operation of the light rail will be put out to tender rather than handed over to a government department or agency. This is the model the government is seeking for ferries, with public ownership but a private operator, and the model that has been rumoured it is seeking for any future metro rail network. I’ve included links to all the major media coverage below. Many are quite similar, so if you’re after something with more depth, I recommend listening to the 2 interviews under the radio section, particularly the Frank Sartor one as he tends to be more opinionated and speculates a lot more. The state government has announced its intention to preserve a corridor for a future extension of the Northwest Rail Link (NWRL), currently slated for completion in 2019. This would allow the government to build a transport line along this corridor at some point in the future without having to resort to expensive property acquisition or underground construction (as is the case with the $8 billion NWRL – its high price tag being one of the major challenges in its construction). Land would still need to be acquired at a future date, but it would be land that is zoned for future public infrastructure, and therefore much more affordable. Examples of recent transport infrastructure built on preserved corridors include the M2 and M7, whose corridors were set aside in 1944, about half a century prior to their completion. A detailed discussion paper is available, which outlines the background and goes into some detail, however I found the 4 page newsletter to be far more useful and to the point (while also including some points omitted in the discussion paper). There are currently 2 options being considered. One goes West, crossing the new Schofields Station and continuing on to Marsden Park, with potential future extension to the Western Line at Mount Druitt or Penrith. The other goes North West, connecting up with the Richmond Line at Riverston Station, then continuing North to Richmond. Both options extend the reach of the NWRL into the Northwest Growth Sector, which is expected to see 200,000 new residents in the coming 25 years or so. Both options would link the NWRL to the Richmond Line. However, it should be noted that this link may not necessarily be a heavy rail link, and could instead be light rail or bus rapid transit (i.e. a T-Way). This is a good idea, as it would be silly to rule out any options now, given that any construction of transport infrastructure on such a corridor would probably be 50 years away and it would be impossible to predict the what the best option would be now. Submissions on a preferred corridor can be made to Transport for NSW until 18 May 2012 at www.northwestoptions.com.au or by attending the public information session at Rouse Hill Town Centre on Saturday 31 March between 10AM and 2PM at the Vinegar Hill Memorial Community Centre, Level 1 (opposite the library). 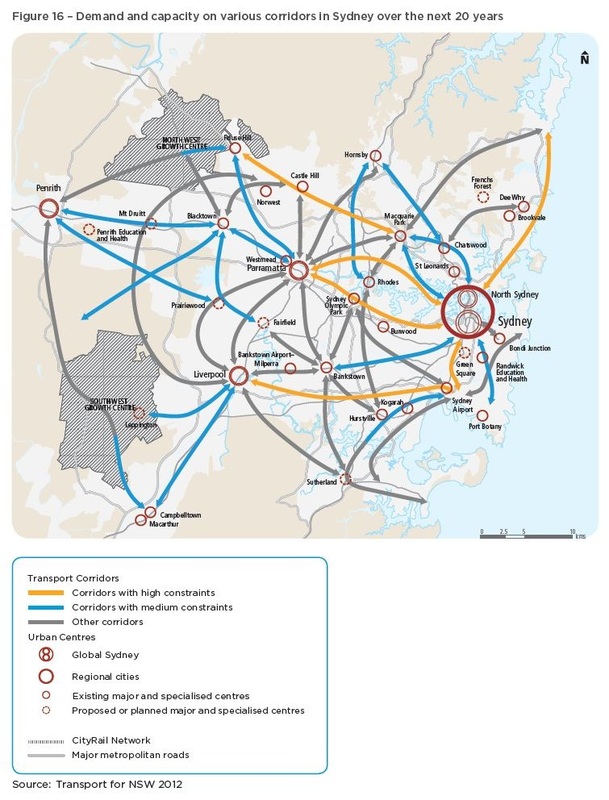 The finalisation of the new transport master plan for NSW is one step closer, with the release of a discussion paper outlining the current context and key challenges for transport in NSW. The next step is public consultation on the masterplan, which will be considered and incorporated into the actual masterplan that is to be finalised later this year. To make a submission, you can contact Transport for NSW on masterplan@transport.nsw.gov.au by 27 April. The key points raised in the discussion paper (relating to commuter transport in Sydney – I have skipped over freight and rural transport), along with the page references are covered below. The main points that I thought were missing, and will mention in my submission, are congestion charges for driving in the CBD and bike share, both of which I discuss briefly below. 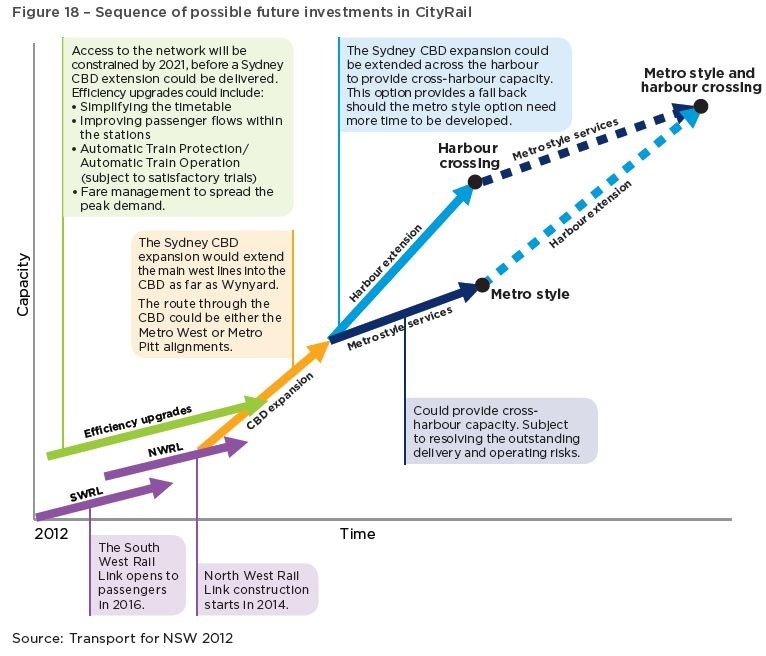 There are a number of corridors in Sydney which will see capacity constraints over the next 20 years. 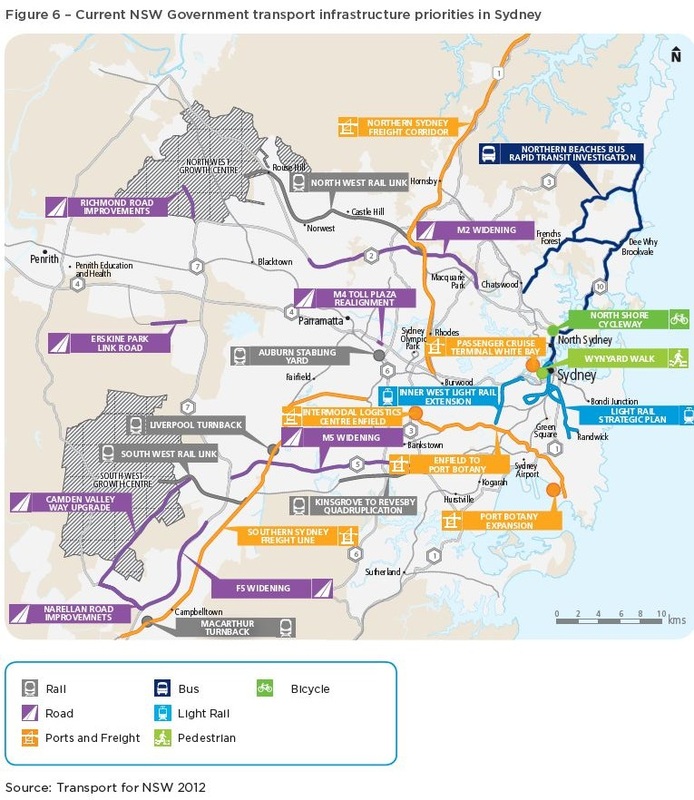 These include (1) CBD to Northern Beaches, (2) CBD to Inner West, (3) CBD to the airport, (4) airport to South-West Sydney, and (5) Macquarie Park to the Northwest Growth Sector (pp. 39-40). 530,000 new jobs will be created in Sydney in the next 2 decades, 50% in Western Sydney and 20% in the global economic arc covering the Macquarie Park -Chatswood-St Leonards-North Sydney-CBD-airport are (p. 34). To be successful, the transport system in Sydney needs to be a single integrated network, rather than a patchwork of competing networks that do not allow for an easy and simple trip from point A to point B. To this extent, the NSW government has created a new transport authority: Transport for NSW (seemingly modelled on Transport for London) which puts customers at the centre of planning and decision making (p. 3). It also accepts that an integrated public transport system uses buses and light rail to compliment and support the heavy rail system, rather than compete with it (p. 3). The freeway network in Sydney still has a few missing links, including the M4 East between Strathfield and Sydney Airport/Port Botany/Sydney CBD, a connection between the Sydney Orbital on the M2 and the F3 at Hornsby, and the Sydney Orbital on the M5 and the F6 in the South (p. 46). The discussion paper was noticeably silent on the issue of congestion pricing for the CBD, which has been used in places like London to reduce traffic congestion and act as a source of revenue for public transport. One way of tailoring services to customer needs is to separate services so that the high frequency all-stop services can operate on different tracks to the express services. This can be achieved through improved timetables linked to the development of new rail infrastructure projects. Timetables need to be customised to the different needs and priorities of customers. Increasing the frequency of trains will reduce crowding and speed up journey times. Increased service frequencies will enable those making short trips within inner Sydney, such as on the Inner West, Illawarra and Bankstown Lines, to ‘turn-up-and-go’ without needing to consult a timetable. Sydney has a highly complex rail network. Fifteen outer lines feed into eight inner lines, which in turn feed into six lines converging through the Sydney CBD. This results in constraints where rail lines converge. Further consideration about how to separate major lines is required. Single deck metro style trains and a second harbour crossing are also discussed, almost to the point where it seems like a certainty that these change will be occurring and that the only question is when, not if (p. 45). Any new light rail lines constructed in the inner city will be designed to fit in and compliment the bus and train network rather than to compete with it. As a result, it will replace a number of bus routes and see a redesign of the bus network to fit in with light rail (p. 49). There is currently a significant amount of congestion in the CBD caused by buses, particularly around Wynyard (from the Harbour Bridge) and Circular Quay (via the CBD). A short term solution of re-routing some lines is provided (p. 48), though nothing is mentioned about long term solutions (though this is likely to involve replacing buses from the Northwest with trains on the Northwest Rail Link and buses from the Eastern Suburbs with light rail). Nor is there any mention of re-organising bus routes to have them travel through the city (as many metrobuses currently do), rather than merely terminating at one end of it, which could potentially eliminate about half the buses travelling through the CBD itself. The ferry system is to be privatised, starting with new private routes that were recently announced, then followed by franchising out the government owned Sydney Ferries to a private operator (p. 51). There was no mention of any other possibilities of privatisation, such franchising out any potential future metro style rail network or for private operation of the Northwest Rail Link, both of which have been rumoured in the press. Both cycling and walking are also said to need to be promoted, but nothing is mentioned about integrating it with rail as was mentioned with buses and light rail (p. 5). Significant work has been put on constructing large (and expensive) park and ride facilities to allow commuters to drive and park their car to the local train station, but relatively little for cyclists to ride their bike and store it before getting on the train, which could significantly increase the catchment area around train stations for people who live too far to walk, have limited bus connections and/or do not to drive to the station for whatever reason. Also not mentioned is bike share (p. 52). Such a scheme was implemented in Melbourne (600 bikes) and Paris (20,000 bikes), but to a much lesser extent in Melbourne than in Paris and therefore never quite reached a critical mass for it be as successful as it was in Paris (click on the link to read Alan Davies’ article about it at The Melbourne Urbanist). Obviously, one challenge to bike share in Australia is the mandatory helmet laws. That aside, imagine how much easier it would be if you could ride your bike to the train station, leave it in a locker, catch the train into the city, then hire one of the bike share bicycles to get you to your final destination. (A similar outcome can be achieved by transporting bikes on buses/trains, but this only works if few people do it and is therefore not scalable to being done by large numbers of people.) This leads to an increase in the area which you can get from and to the train station at both ends of your journey, making public transport a much more attractive option. Jarrett Walker over at Human Transit refers to this as the “last mile issue” and has some interesting further reading on the topic. I recently got back from a 3 week holiday from all over the USA (which also explains the lack of activity here of late – my apologies for the lull, but I’ve had a bunch of things to catch up on and this hasn’t been high on my priorities). As it’s my first post since I getting back, I thought I’d write a bit about my encounters with public transport during my travels. Wheaton Station on the Washington D.C. Metro has the longest escalator in the Western Hemisphere. I went there to check it out for myself, and took two and a half minutes to get to the top of it. See video below. Los Angeles really is designed for cars, rather than public transport. The city actually has a good network of cris-crossing lines that can get you from just about anywhere to just about anywhere else, but because the city is so spread out this can take a very long time. Only the poor people who cannot afford their own car use public transport. I drove there for one day, and the freeways seemed quite well designed, operating at full capacity, but with the use of traffic lights on the on ramps to keep them from going over the maximum capacity and leading to traffic jams on the freeway. This leads to localised traffic jams around the city, but keeps them from spreading through to the rest of the city via the freeways. New York (Manhattan in particular) is very easy to get around on trains, buses and on foot. I wrote a post about it on my travel blog while I was away which I will repost below, and which you can read here. San Francisco has more modes of transport than I have seen anywhere else: heavy rail, light rail, trams, cable cars, trolley buses, buses and ferries. I also wrote about it on my travel blog (here and here), and have again reproduced the relevant portions below. There’s a lot of transport options in New York, so much so that only something like 25% of Manhattan’s 1.5 million residents own a car. There’s long distance Amtrak trains which will take you to Boston, Philadelphia, Washington DC or pretty much anywhere else in the Northeast United States. Ten there’s commuter rail, like Long Island Rail if you’re going to Long Island (past Queens and Brooklyn) or PATH if you’re going to New Jersey, but I’ve also seen trains that go to nearby Connecticut. All these trains tend to go either to Grand Central Terminal (if the come in from the North) or Penn Station (if the come in from Long Island), with PATH trains just terminating on the Western edge of Manhattan. On top of that there are also ferries to take you to one of the many islands around here. It’s easy to forget that of New York City’s 5 boroughs – Manhattan, Brooklyn, Queens, The Bronx, and Statten Island – only The Bronx is on mainland America. Buses are either local or express. Local buses fit in to the subway system, so I’ll talk about them later. Express buses cost $5, which is expensive when compared to a local bus or subway trip at about $2, and I don’t know much more about them than that. The subway is quite a complicated tangle of lines, but for the most part follows Manhattan’s street grid system. Most lines go North/South along the Avenues. At their Northern ends, the lines either terminate in uptown Manhattan, continue North into The Bronx, or turn East into Queens. On their Southern end, the lines either terminate in downtown Manhattan, or turn East into Brooklyn. 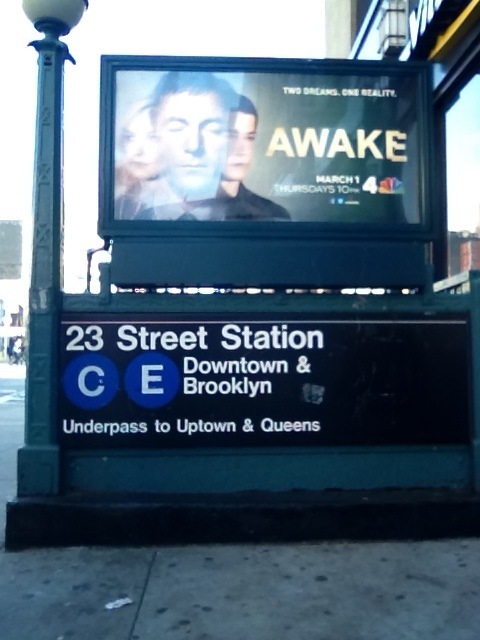 All the trains therefore indicate their direction by saying uptown/Queens or downtown/Brooklyn. This is important as some entrances/exits are for only one direction, and if you get it wrong then you must exit and pay to enter on the other end. Here’s one example, you can see which lines serve this station and also the direction in which they go (some entrances will let you enter to either platform, as this one indicates). There are also a couple of East/West lines, though only 2 of these are East/West the whole way in Manhattan, with the rest spending part of their time in Manhattan traveling North/South. Not only do most subway lines travel along the Avenues, but they have stops on the same Streets. I’ll use my experience as an example. I’ve spent most of my time in midtown Manhattan, which you can see below. My hostel is on the corner of 23rd Street and 11th Avenue (middle on the left), which means I have to walk along 23rd Street until I reach 8th Avenue, where I can get on the subway station there. 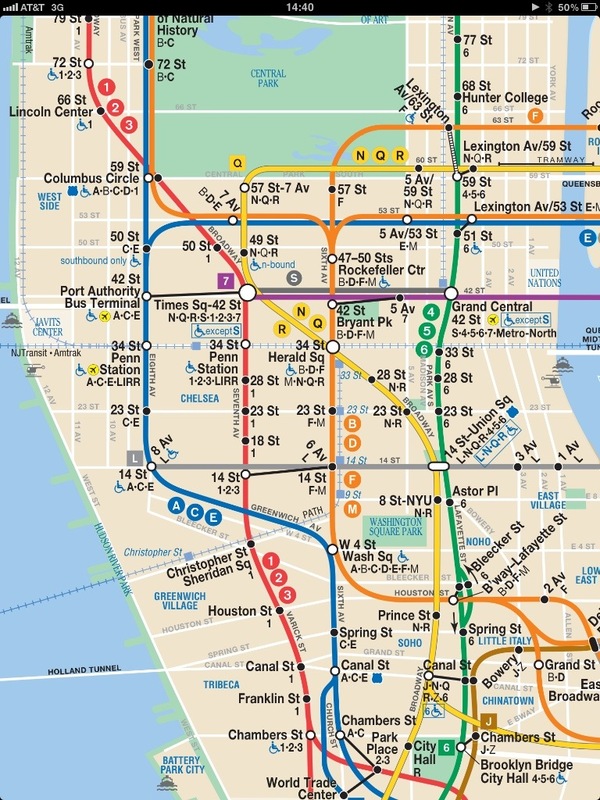 Or, if I want to get on another line, I just keep walking East along 23rd Street until I get to 7th Avenue, 6th Avenue, 5th Avenue or Park Avenue, where there are other stations. And this is where the local buses come into play. Each of these streets with subway stations along it has a bus line running in each direction. So if you want to get anywhere, you catch a bus East/West, then get a train North/South and get to where you’re hoping to get to. It’s that simple. If you’re going further, then the lines start to deviate, but criss cross in order to allow you to change from one train to another in order to get to where you need to go. The first few times you use it, it’s easy to get lost or disorientated (such as going in the wrong direction or taking an express train instead of a local – all stops – train), but pretty soon it becomes second nature. Since I’m here for 8 days, I just paid for a 7 day unlimited pass. It cost me $29 and let’s me travel on the subway and local buses as much as I want for a week. Considering I spent $46 for a little over 4 days in Washington DC for transport on the metro, and even then I was restricted to travel only after 9:30AM on weekdays, it’s a really great way to get around. And even then, because the city is so compact and dense, it’s massively walkable. Many times I don’t even bother getting a train or a bus, I just walk. Sure beats having to hire a car in LA, that’s for sure! Much like New York, San Francisco is misunderstood. People, myself included, assume that San Francisco is a large city, but it is only one city in a larger metropolitan area known as the “Bay Area” that includes cities like Berkley, Oakland, San Jose, etc. This is much like how Greater New York City is a huge metropolitan area, but when people think of New York, they are actually thinking of Manhattan island. This confused me a little with transport, because both San Francisco and the Bay Area each have their own public transport (MUNI and BART respectively). BART (Bay Area Rapid Transit) is a rail system that goes around the entire Bay Area and would transport me between the airport, San Francisco and Lafayette. MUNI (Municipal Railway) is only for San Francisco itself, and is the transit agency that runs the cable cars, trams, light rail and trolley buses that San Francisco is famous for. It took me a little while to work this out, and to then work out how to pay (New York, and it’s unlimited weekly ticket, had spoiled me a little) but I was soon off on a BART train to San Francisco. I had a few hours to do some sightseeing before getting back on the BART to Lafayette, so I headed off to the iconic Castro area of the city. It was around here that I also saw my first San Francisco tram! The trams in San Fran are either the old street cars, which run entirely above ground along Market Street into the city and then down to Fisherman’s Wharf, or they are light rail which run above ground in the suburbs but underground underneath Market Street next to BART until they reach the city. The tram I saw was one of the light rail trams. After the Castro I got on one of the above ground street cars and headed down Market Street into the city. These street cars are all PCC model street cars, and are the North American equivalent of the W Class trams you see in Melbourne on the City Circle route. Each of these trams has a sign on the side telling you which city they were originally from, as many American cities had streets lined with trams in the first half of the 20th century which were often sold to San Francisco when these lines were decommissioned (since San Francisco kept its trams, just as Melbourne did). I even saw a tram from Italy! Each of these trams has information on the inside about its history and where it is from. It was very fascinating to take in these little details. San Francisco also has trolley buses (which use overhead wires for power, rather than petrol) and cable cars (which are the street cars going up and down the steep San Francisco hills which people often associate with the city). But I didn’t go on either on the Saturday, so that’s all I’ll say about them for now. I took the F-Line tram around to Fisherman’s Wharf. This is the same tram line that I caught [earlier] that runs on the surface of Market Street and uses heritage trams. Fisherman’s Wharf seemed very touristy, based on how crowded it was. 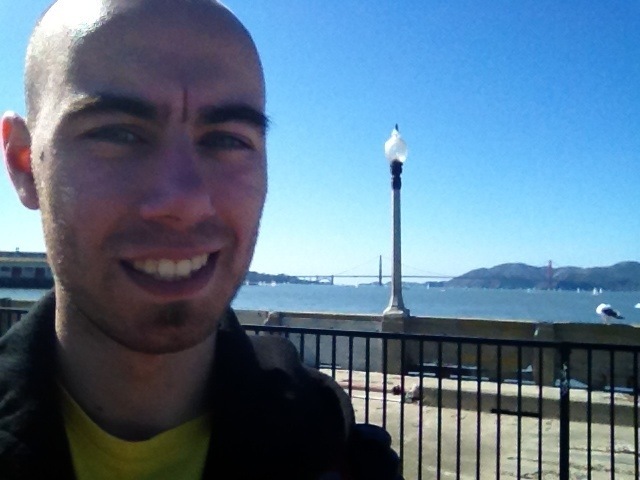 From there you can get a view of Alcatraz and the Golden Gate Bridge. I walked over to a pier so that I could get a better sight of both. Then it was time to get the cable car back to market street. The cable cars don’t use electricity, instead they are powered by a cable running underground that the cable car grabs on to in order to move. 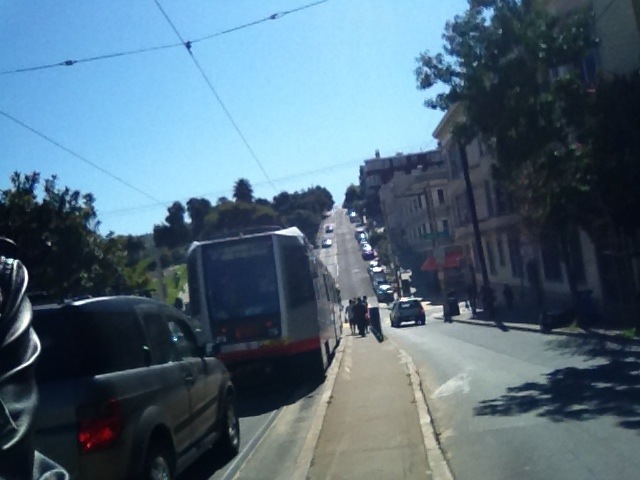 This allows it to climb San Francisco’s steep hills. The line is quite long (I waited 40 minutes), the journey isn’t quick (roughly half an hour) and the fare is relatively expensive ($6, compared to $2 for MUNI), so few commuters use the cable cars. It’s mainly tourists who use it. There are 3 cable car lines. I took the Hyde-Powell line, which goes from Fisherman’s Wharf back to Market Street. The cable car is quite crowded, so I didn’t get to see as much as I wanted to, but I still got to see plenty from the hills of San Francisco. We also went past Lomard Street, the famous windy road in San Francisco. But as my view was partially blocked, I didn’t really get a good look at it. At the end of the cable car ride it was back on BART and off towards the airport. The wait for the cable car had been longer than I had expected, so much like my transport to the airport at the start of my journey, I was cutting it a bit fine and arrived with only an hour before take off. But I made it, and am now writing this somewhere over the Pacific near New Zealand.